Fantastic guest recipe from Hemsley & Hemsley. 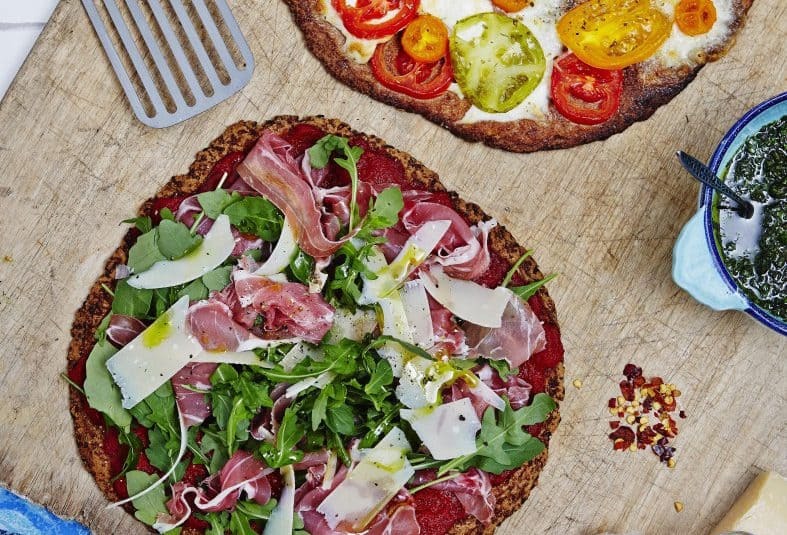 A delicious pizza base made with cauliflower and protein rich ingredients such as almonds, egg and buckwheat. Simply add the tomato sauce base and toppings of your choice. Doubling the recipe to freeze one is also a great idea. Extracted from The Art of Eating Well by Melissa and Jasmine Hemsley. Published by Ebury Press, £25. Preheat the oven to fan 190°C/Gas mark 6. Line a baking tray with parchment paper and lightly grease with butter, ghee or coconut oil. Make the tomato sauce: gently heat the ghee in a pan over a medium heat and fry the garlic for 1 minute, then add the chopped tomatoes, oregano, salt and pepper and a little chilli, if you like. Cook the tomatoes down to a thick sauce over a medium heat, lid off,which will take about 15 minutes, then mash the tomatoes with your spatula or blend to a paste if you like things less rustic. Put all of the pizza base ingredients into a bowl and mix well with a spoon, or add to the food processor and blend, to form a sticky dough. Spread the dough out with the back of the spoon on the prepared tray, shaping it into a 30 cm-diameter. Bake in the oven for about 20 minutes, flipping it over after 15 minutes to cook the underside. Choose your pizza topping from the options opposite and cook as instructed. Serve the pizza with a big green salad and drizzle over some Brazil Nut Pesto (from page 198), if you like. FOR A PARMA HAM AND ROCKET TOPPING: spread the tomato sauce over the base of the pizza with the back of a spoon. If you’ve made the sauce in advance and it’s cold, rebake the tomato-topped pizza for 5 minutes before adding your toppings. Top with 4 slices of Parma ham torn into small pieces, 2 handfuls of rocket and some Parmesan shavings. Add chilli flakes, if you like. FOR A TOMATO AND MOZZARELLA TOPPING: pull apart 1 medium mozzarella ball into small pieces and arrange over the base of the pizza. 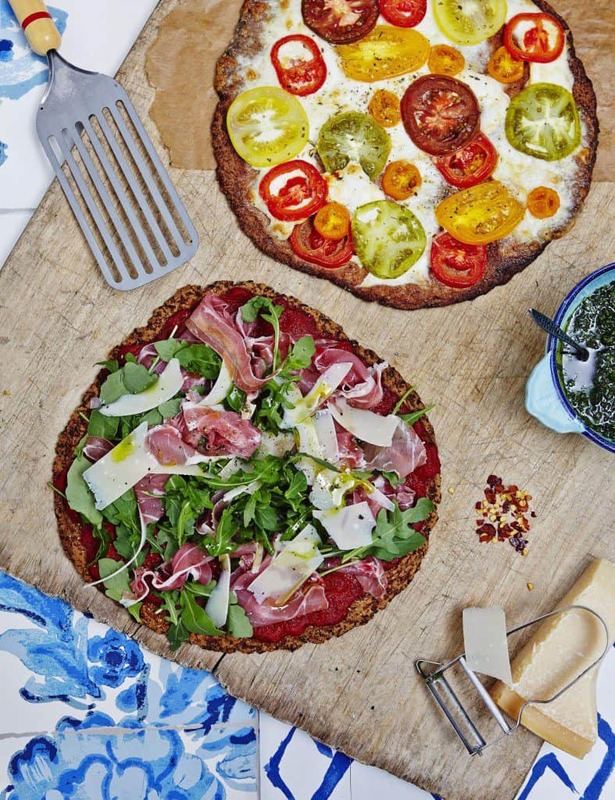 Slice 2 handfuls of fresh tomatoes into 1 cm-thick slices (a mixture of colours looks good) and arrange over the pizza. Add chilli flakes, if desired. Bake for 10 –15 minutes until the mozzarella is melted and bubbling.